There are thousands of endangered animals in the world. Some are to a lesser extent than others, yet they all are in need of help. These animals can be found in every continent of the world, not just those more exotic or remote areas. The plight of these animals is widespread and yet many people either don’t know or don’t care about them. It is this ignorance that has lead to many endangered species to become extinct. Recently the International Union for Conservation of Nature added the African Black Rhinoceros to the list of extinct animals in the wild. Although there are still some Black Rhinos in captivity, either in zoos or wildlife conservation centers, this is still sad news. Poaching and land loss were the main culprits to the extinction of the Black Rhino. Though the Black Rhino will no longer be seen roaming the plains of Africa there is still the White Rhino, whose populations are declining as well. Sadly if things do not improve the White Rhino may be soon added to the list of extinct animals in the wild as the species population is listed as being on the brink of extinction. The Black Rhino was not the only animal recently added to the extinct animals list. Others include the Pig-Footed Bandicoot, Sooty Crayfish, Polynesian tree snail and the Laughing Owl. There are others that have not been listed here and the list is growing rapidly each year. There is some hope that perhaps one day Black Rhinos can be reintroduced into the wild. Through extensive breeding programs and help and eduction through organizations, such as World Wildlife Fund and African Wildlife Foundation, the captive Rhino population may rise enough to allow for a number to be placed into the wild once more. There have been previous success stories of animals either at the brink of extinction or labeled as extinct in the wild being reintroduced to their natural habitat and surviving. The Red Wolf, Arabian Oryx and Przewalski’s Horse are among those who have successfully been returned to the wild and can still be seen there today. One place in particular who breeds Rhinoceros in captivity, though they breed White Rhino not Black, is the Fossil Rim Wildlife Center in Glen Rose, Texas. This facility also breeds several other African endangered species including the Reticulated Giraffe, Arabian Oryx and a selection of Antelope. They also breed species from Europe and Asia. Breeding programs, such as the one at Fossil Rim, are essential to keeping the captive population growing, ensuring genetics are spread among the animals and to possibly one day have a good sized group of animals to release back into the wild. The Rhinoceros has always been my favorite wild animal for as long as I can remember and it makes me sad to think that one day there may not be any left in the wild at all. I fully support conversation efforts for these animals, and all other endangered species, for the sake of our future and theirs. 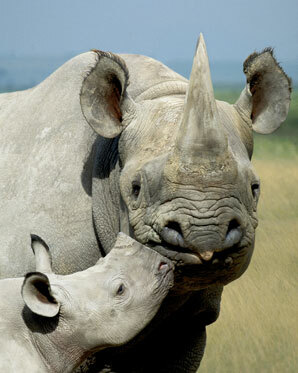 I hope that one day I can travel to Africa and see wild rhinoceros in their natural habitat.